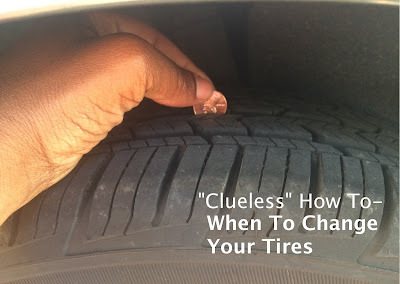 I've been doing a lot of mini-road trips lately and with that comes the stress I put on my tires. Grr… Florida roads are costing me $$$. I swear the construction on the same streets, roads, and highways is never ending. Anyways, I looked up information online and I came across this video and it gave me a natural high. Don't judge me! It was the coolest thing and I just love finding stuff like this. So after I did the penny test, I needed to replace three tires. The fourth was already replaced awhile back so I knew I didn't need to get 4 brand new tires. The next day (ok not really a few days two weeks later) I went to get some new tires and asked the rep to assist me in which tires needed to be replaced. Mind you I already knew exactly what 3 needed to be replaced but wanted a second opinion. Guess what? I was right! The same tires I knew that needed to be replaced were the same ones he said needed to be replaced. As he was checking them he said I must travel on the highway a lot. He was right. I honestly hate driving on the highway but it's the best and quickest route for where I need to go. Anyways, y'all should see me being nosy at the red light looking at other peoples tires like…. The front passenger tires are ok but the back needs to be replaced. Lemme tell them *green light* Dang! Gotta go. Have you done the penny test?